A layered, baked breakfast dish that generally contains eggs, bread and cheese. 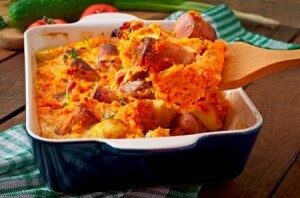 This guide contains egg strata recipes. A breakfast strata that you make the night before. It is so good! First you start with brown sugar, butter and syrup in the bottom of the baking dish. I love the fact you can make it before hand and have it ready for the next day, especially if you have company. Or just want to do something special for the family. It is a good dish for a brunch also as all the work is done the night before and you can throw it in the oven bake and go! Combine brown sugar, butter and corn syrup in medium saucepan. Heat until melted and bring to a boil. Pour syrup in a glass 9x13 inch baking dish. Place bread slices in syrup. Combine eggs, milk, salt and vanilla. Whisk to blend and then pour over bread. Sprinkle with cinnamon. Cover with foil and put in fridge overnight. In large bowl, whisk eggs, milk, mustard, salt and pepper. Stir in bread, cheese, ham, onion, and green pepper. Pour mixture into greased 9x13 inch baking pan. Cover; refrigerate overnight. When ready to cook, preheat oven to 350 degrees F. Bake, covered, 1 hour and 15 minutes or until set in center and golden brown.